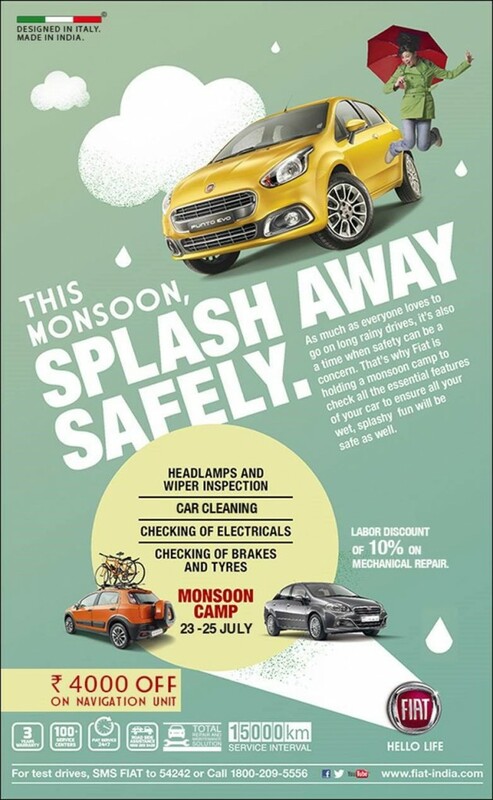 FIAT India today announced that the company is going to organize monsoon check-up camps at some of its exclusive dealerships for three continuous days starting from July 23 to July 25. This step has been taken in continuation with (FIAT Chrysler Automobiles) FCA’s strategy to reach out to its huge base of customers located across India and also to reiterate its commitment to the Indian market. FIAT‘s privileged customers would enjoy wide range of benefits in this camp. FCA is also going to provide an extensive 60-point free check-up for all their customers with free top car wash and 10% discount on labour shall be provided to the customers (Only on Mechanical Repairs inclusive of electrical repairs). Along with this, the FIAT is also offering a discount of Rs 4000 on GPS Navigation Unit. Fiat exclusive dealership executives would contact existing customers through text messages and e-mails to inform them about these camps. Fiat has strengthened its presence in India by lengthening its reach to provide world-class service to the customers spread across India.